Cap de Barcelona, skulptarto, miksaj rimedoj, Barcelono. Roy Fox LICHTENSTEIN (prononce [ˈ|l|ɪ|k|t|ən|ˌ|s|t|aɪ|n]; 27an de oktobro 1923 – 29an de septembro 1997) estis usona popartisto. Dum la 1960-aj jaroj, kun Andy Warhol, Jasper Johns, kaj James Rosenquist inter aliaj, li iĝis elstara figuro en la nova arta movado. Lia verko difinis la bazan principon de poparto pere de parodio. Favore al la bildstrio kiel sia inspiro, Lichtenstein produktis akrabordajn, precizajn komponaĵojn kiujn li dokumentis dum li parodiis ofte laŭ humora parolmaniero. Lia verkaro estis tre influita kaj de populara reklamado kaj de la bildliteraturo. Li prikcribis poparton kiel "ne 'usona' pentrarto sed fakte industria pentrarto." Liaj pentraĵoj estis ekspozicitaj en la Galerio de Leo Castelli en Novjorko. Whaam! kaj Drowning Girl estas ĝenerale konsiderataj kiel la plej famaj verkoj de Lichtenstein, kun Oh, Jeff...I Love You, Too...But... eble la tria. Drowning Girl, Whaam! kaj Look Mickey estas konsiderata kiel liaj plej influaj verkoj. Woman with Flowered Hat (Virino kun florĉapelo) tenis la rekordon por plej alta prezo en aŭkcio de la verkoj de Lichtenstein ekde la 15an de Majo, 2013, kvankam tio estis ĵus superita en 2015 de Nurse. ↑ Roy Lichtenstein: Biography of American Pop Artist, Comic-Strip-style Painter.. Encyclopedia of Art. Alirita 2013-06-05. ↑ Cronin, Brian. Why Does Batman Carry Shark Repellent? : And Other Amazing Comic Book Trivia!. Penguin Books. ↑ Collett-White, Mike (2013-02-18)Lichtenstein show in UK goes beyond cartoon classics. Chicago Tribune. Alirita 2013-06-08. ↑ Kirkova, Deni (2013-02-19)Pop goes the Tate! Iconic works of Roy Lichtenstein brought together for exciting new exhibition at the Tate Modern. Daily Mail. Alirita 2013-06-07. ↑ Hoang, Li-mei (2012-09-21)Pop art pioneer Lichtenstein in Tate Modern retrospective. Chicago Tribune. Alirita 2013-06-08. ↑ Pavia, Will, "The King of Diamonds comes up trumps in auction", The Times, May 16, 2013. Kontrolita May 20, 2013. ↑ Vogel, Carol. "Christie’s Contemporary Art Auction Sets Record at $495 Million", New York Times, 2013-05-16. Kontrolita 2013-06-07. ALLOWAY, Lawrence. (1983) Roy Lichtenstein, Modern Masters Series 1. New York: Abbeville Press. ISBN 0-89659-331-2. COPLANS, John. 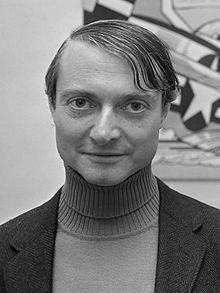 (1972) Roy Lichtenstein. New York: Praeger. OCLC 605283. CORLETT, Mary Lee. (2002) The Prints of Roy Lichtenstein : a Catalogue Raisonné 1948–1997, 2‑a eldono, New York, NY: Hudson Hills Press. ISBN 1-55595-196-1. HENDRICKSON, Janis. 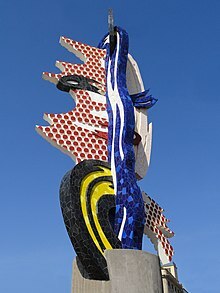 (1988) Roy Lichtenstein. Cologne, Germany: Benedikt Taschen. ISBN 3-8228-0281-6. LOBEL, Michael. (2002) Image duplicator : Roy Lichtenstein and the emergence of pop art. New Haven, CT: Yale University Press. ISBN 978-0-300-08762-8. LUCIE-SMITH, Edward. (September 1, 1999) Lives of the Great 20th-Century Artists. Thames & Hudson. ISBN 978-0-500-23739-7. (1999) Off limits : Rutgers University and the Avant-Garde, 1957–1963. Newark, N.J.: Newark Museum. ISBN 0-8135-2610-8. SELZ, Peter. (1981) “The 1960s: Painting”, Art In Our Times: A Pictorial History 1890–1980. Harry N. Abrams, Inc.. ISBN 0-8109-1676-2. ADELMAN, Bob. (1999) Roy Lichtenstein's ABC's. Boston: Bulfinch Press. ISBN 978-0-8212-2591-2. WALDMAN, Diane. (1988) Roy Lichtenstein : Drawing and Prints. Secaucus, N.J.: Wellfleet Books. ISBN 978-1-55521-301-5.